Eric Young has had a long storied pro wrestling career that has led him into the world of reality TV and extreme fishing. Join Eric and Steve as they talk about Eric's role as host of Animal Planet's OFF THE HOOK: EXTREME CATCHES as well as his time in TNA, his many WWE tryouts and Eric's connection to Marvel's Wolverine. Start your Scotts Turf Builder Program today to give your yard the nourishment it needs. This...is a Scotts Yard. Download the Vivid Seats app and enter code STONECOLD for 10% OFF your first order! It's the BATTLE OF THE CENTURY as Steve Austin squares off against Mr. Fly south of the border in this classic episode! Create a free account on BetOnline.AG and receive a 50% SIGN UP BONUS just by using the promo code PODCASTONE Start your Scotts Turf Builder Program today to give your lawn the nourishment it needs. This...is a Scotts Yard. Its a Lucha House Party at 317 Gimmick Street as Steve is joined by WWE Superstar Kalisto (!) for his first-ever podcast appearance (!!) anywhere ever (!!!) Check it out as Steve and Kalisto shoot the breeze about lucha libre, the importance of the mask, Eddie Guerrero, Rey Mysterio, the origin of his name, Kalisto's wife's homemade salsa and much more. Head over to BetOnline.AG and use promo code PODCASTONE to receive a 50% sign up bonus. Go to www.DDPYoga.com/Austin to get 20% off the Annual Membership for DDP YOGA NOW App and all DVD packs Sign up at SteveAustin.RobinHood.com to get your FREE stock and learn how to invest with the Robin Hood app! Dr. Tom Prichard is back with Steve for the second part of a conversation discussing his new wrestling school and the time he trained Vince McMahon for his match against Steve Austin at WWF St. Valentine's Day Massacre 1999. Later in the show, Steve - along with his illustrious wife Kristen - gives the Heisman stiff arm to the rumors and innuendo about him quitting alcohol to take up weed and yoga. He's doing the yoga but you all got the rest of it wrong. Listen in as Steve sets the record straight. Head over to BetOnline.AG and use promo code PODCASTONE to receive a 50% sign up bonus. Go to www.DDPYoga.com/Austin to get 20% off the Annual Membership for DDP YOGA NOW App and all DVD packs Check out Theraworx Relief today at select CVS, Rite-Aid and Walgreens Pharmacies, or at TheraworxRelief.com Visit GetQuip.com/STEVEAUSTIN to get your first refill pack of replacement brush heads FREE with a QUIP electric toothbrush. WALTER has become known as one of the hardest hitting talents on the independent scene today. Seriously....check out his chops! WALTER stops by 317 Gimmick Street today to talk with Steve about breaking into the wrestling business in Germany and wXw, the influence Otto Wanz had on him, how soccer helped prepare him for pro wrestling, training for endurance and much more. Head over to BetOnline.AG and use promo code PODCASTONE to receive a 50% sign up bonus. Check out Theraworx Relief today at select CVS, Rite-Aid and Walgreens Pharmacies, or at TheraworxRelief.com Sign up today at SteveAustin.RobinHood.com to get your FREE stock! The King of Dong Style, Joey Ryan, shows up to 317 Gimmick Street looking dapper as ever to chat with the man about all things pro wrestling. Join Steve and Joey as they talk about the art of doing business on the independent scene, Joey's epic involvement at ALL IN, BAR Wrestling, marriage proposals and being one of the founders of Pro Wrestling Guerrilla. Go to www.DDPYoga.com/Austin to get 20% off the Annual Membership for DDP YOGA NOW App and all DVD packs Check out Theraworx Relief today at select CVS, Rite-Aid and Walgreens Pharmacies, or at TheraworxRelief.com WWE 2K19 is out now....go to WWE.2K.COM to pick up the WWE 2K19 Deluxe Edition! Visit GetQuip.com/STEVEAUSTIN to get your first refill pack FREE with a QUIP electric toothbrush. WWE announcer and host of the CHASING GLORY podcast, the delightful Lilian Garcia joins Steve at the crib today! Listen in as Steve and Lilian discuss the recent Liv Morgan/Brie Bella in-ring incident, singing the National Anthem, catching up with Trish Stratus, moving out of Marina Del Ray and much more! Check out Theraworx Relief today at select CVS, Rite-Aid and Walgreens Pharmacies, or at TheraworxRelief.com Go to www.DDPYoga.com/Austin to get 20% off the Annual Membership for DDP YOGA NOW App and all DVD packs Jump over to ZipRecruiter.com/Steve to try Zip Recruiter for FREE! WWE 2K19 is out now....go to wwe.2K.com to pick up the WWE 2K19 Deluxe Edition! Steve takes his show on the road, up the 405 to visit Sean Waltman aka X-Pac to shoot the breeze about pro wrestling. Join the duo as they talk about NXT Takeover: Brooklyn IV, tours of Japan, the state of pro wrestling today and where its headed and even some Puerto Rico. Head over to BetOnline.AG and use promo code PODCAST1 to receive a 50% sign up bonus. Visit HyundaiUSA.com/ShopperAssurance for all the information about Hyundai's new Shopper Assurance program. Go to Tecovas.com/STEVE to check out Steve Austin's personally curated collection of Tecovas boots. Steve's sitting down with his nephew Neil Wiegand, reflecting on all their outdoor adventures at BSR 2.0. Also, Neil contemplates his YouTube career and Steve gets stuck in the mud....literally. Head over to BetOnline.AG and use promo code PODCAST1 to receive a 50% sign up bonus Get Theraworx Relief today at select CVS, Rite-Aid and Walgreens Pharmacies, or at TheraworxRelief.com Go to Tecovas.com/STEVE to check out Steve Austin's personally curated collection of Tecovas boots. Leon "Big Van Vader" White passed away last week at the age of 63. He was a 3x WCW World Heavyweight Champion, a 3x IWGP Heavyweight Champion and widely considered to be one of, if not the premiere, big men in the sport of Pro Wrestling. Join Steve as he re-releases an interview with Leon from his podcast archives as they talk about Vader's time in Japan, breaking into the AWA under Verne Gagne, establishing the Vader persona and his run in WCW. Go to www.DDPYoga.com/Austin to get 20% off the Annual Membership for DDP YOGA NOW App and all DVD packs Visit https://www.adt.com/PODCAST to take advantage of ADT's lowest rate at $28.99! Comedian Craig Gass has been mentored by George Carlin, roomed with Mitch Hedberg and written for the Howard Stern Show. He's even met Kenny G (you won't believe where). Craig joins Steve today for a wild chat about comedy legends, overcoming addiction and making it in the comedy world. More with Craig Gass this coming Thursday on The Steve Austin Show. Go to www.DDPYoga.com/Austin to get 20% off the Annual Membership for DDP YOGA NOW App and all DVD packs Get a TWO-MONTH FREE TRIAL of the WWE Network at www.WWENetwork.com/AUSTIN Visit www.adt.com/PODCAST to take advantage of ADT's lowest rate at $28.99! The World's Largest Athlete and former WWE/WCW/ECW World Champion, The Big Show, joins Steve on the podcast today and it is indeed, a big show! Show and Steve talk birds, boats, travel, working with the Special Olympics and Big Show's recent hip surgery. Part Two featuring YOUR questions for The Big Show is coming at you next Tuesday! Go to www.DDPYoga.com/Austin to get 20% off the Annual Membership for DDP YOGA NOW App and all DVD packs Visit ForHIMS.com/Unleashed to get a trial box of hair loss prevention products for just $5 Check out www.ziprecruiter.com/Steve to try Zip Recruiter for FREE! Its a full house today on the podcast as Every Time I Die guitarist Andy Williams along with Braxton Sutter and Knockouts champion Allie from Impact Wrestling stop by 317 Gimmick Street. Andy is not only ripping it up on stage but also in the ring as a pro wrestler, tagging with Braxton on the indies. Join Steve, Andy, Braxton and Allie as they talk about the Monday Night Wars, life on the road, going straight-edge and marriage proposals. More with Andy Williams, Braxton Sutter and Allie coming up on Thursday's podcast. Major League Wrestling's Court Bauer joins Steve to recap this year's "Showcase of the Immortals," Wrestlemania 34 from New Orleans. Be here for Steve and Court's analysis of an action-packed card as well as thoughts on where the WWE goes next. Plus, Steve shares his Wrestlemania New Orleans experience, from signing autographs at WrestleCon to hanging out with Hurricane Helms and the Boogeyman! Steve and OVW legend "Starmaker" Kenny Bolin are big fans of AMC's THE WALKING DEAD and they've got lots to unpack when it comes to the show. Join Steve and Kenny as they discuss some of their highlights from Season 8, their favorite characters and even a few gripes about Rick Grimes and friends. We've also got some WWE Hall of Fame talk as well! The oft-requested, the one and only Joey "Coco" Diaz finally joins Steve at 317 Gimmick Street for a hilarious and unpredictable conversation. Be here for tales from the set of THE LONGEST YARD (Adam Sandler version), stories about kicking substance abuse, Joey's love for the South, riding motorcycles in New Jersey and THE EXORCIST!! Former WWE and WCW superstar Brutus "The Barber" Beefcake joins Steve this week for a look at the stories behind his new book, BRUTUS "THE BARBER" BEEFCAKE: STRUTTIN' & CUTTIN'. Brutus and Steve discuss Brutus's early athletic years, how he was hooked by pro wrestling, his entry into the WWF and working at the first-ever (and subsequent five) WrestleManias, life on the road, his relationship with Vince McMahon, his life-changing parasailing accident, how Brutus "The Barber" came to be and much more! WWE superstar Elias joins Steve at 317 Gimmick Street for a chat about his road to the WWE, time spent on the independent circuit, some of the wickedly awesome ring names he's had in the past, his musical influences, baseball, working in the ring with Roman Reigns & Jason Jordan and much more! Also, Steve reveals what he thought Elias has been saying all along with "WHO WANTS TO WALK WITH ELIAS?" Country music superstar Luke Bryan joins Steve on the podcast today, talking about his new album WHAT MAKES YOU COUNTRY. Sit in with Steve and Luke for hunting stories, Luke's pre-show ritual, his influences as a performer and his and Steve's mutual admiration for chocolate labs and watches. "The Boss" Sasha Banks joins Steve this week at 317 Gimmick Street to share her incredible journey onto becoming a WWE Superstar. Sasha discusses her childhood, MMA training, her wrestling training in Massachusetts, how she created "The Boss" in NXT, dealing with nerves before a match, favorite places to perform, future plans and much more! 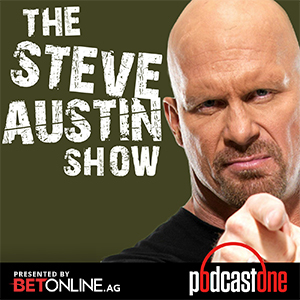 Steve takes on YOUR questions, sent in to questions@steveaustinshow.com, covering a plethora of topics. Join us for an update on the search for the Broken Skull Ranch, Version 2.0, the time Owen Hart and Mankind wrestled with a bag of popcorn, the latest on Steve's truck, Stone Cold's current core workout, King of the Ring 1997, the origin of DTA and stories about Gentleman Chris Adams. Steve's back from Texas to catch up with Ken Anderson - formerly Mr. Kennedy in the WWE - to talk about Ken's pro wrestling school, The Academy, which he runs with Shawn Daivari and Molly Holly in Minnesota. Join us as Ken and Steve break down the finer points of pro wrestling training, managing career expectations, what happened with Ken's run in the WWE as well as his time in TNA, Ken's battle with painkiller abuse and how he won that battle, and the perils of wearing body jewelry in the ring. Comedian, podcaster and ex-UFC fighter Brendan Schaub (THE FIGHTER & THE KID, BIG BROWN BREAKDOWN) joins Steve for the first time to talk about transitioning from the fight game to the entertainment world. Check us out as Steve and Brendan get into the Ric Flair 30 For 30, the parallels between UFC fighters and WWE Superstars, Brendan's burgeoning stand-up career, the mental process of taking damage in a fight and the perils of arm wrestling. Steve Austin and Ted Fowler Answer YOUR Emails! 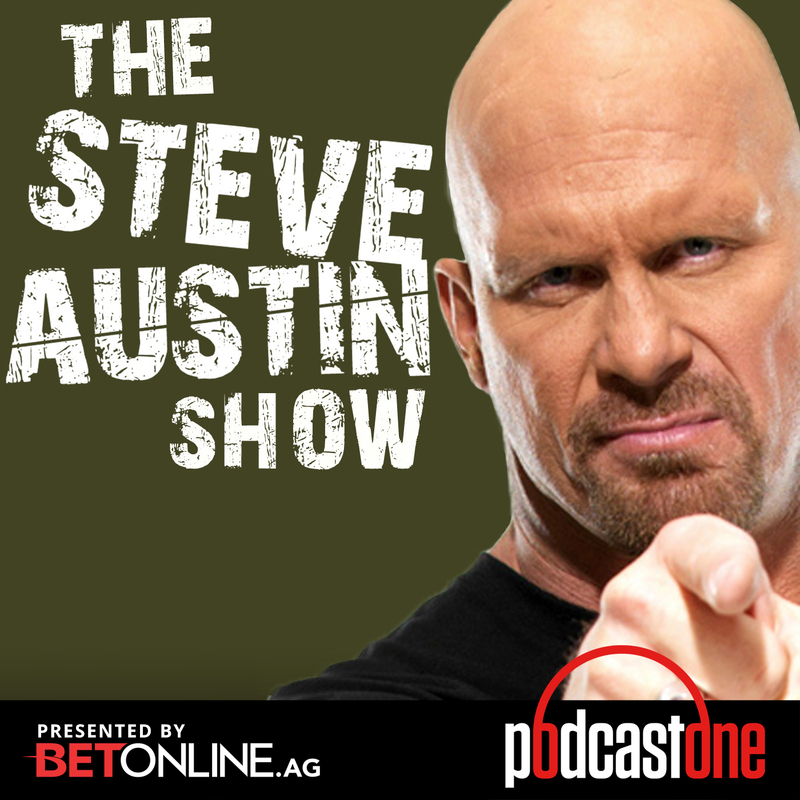 Steve Austin Takes Your Calls - Part 2!